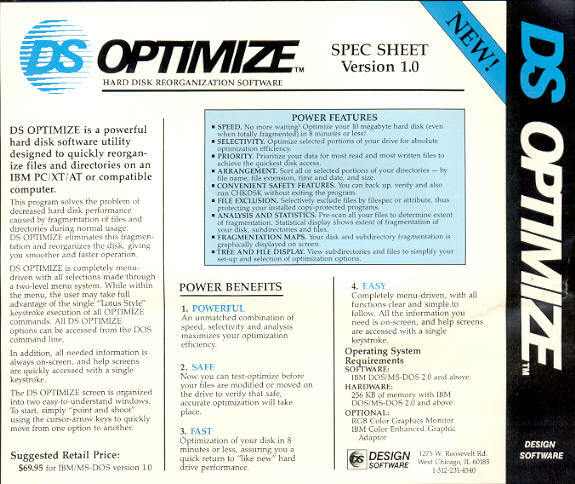 Design Software's DS-Optimize was one of the first handfull of commercial hard disk optimizers / defragmenters available in the late 1980's. 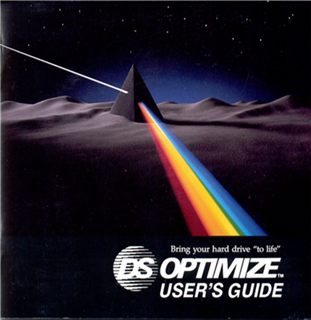 The first version of DS-Optimize used the technology that we wrote for the SST disk optimizer, noted for its high speed - all in memory algorithm. Both DS-Optimize version 1.X and SST had the drawback that if you unplugged the machine during the optimization, all disk contents were lost. It's interesting to note that we're not aware of a case of this ever happening. The second version of DS-Optimize used a slower hard disk optimization algorithm similar to that used by more modern disk defragmentation systems. This is the main screen of DS Optimize showing a directory listing for the current directory of the selected disk. This is a visual display of the current fragmentation of the disk being viewed. This is the disk status screen, which details the various metrics about the disk.